Although she was surprised to be leading the women’s individual two day Kathmandu Coast to Coast Selena Metherell’s father had no doubt she would do well. Selena, who has represented New Zealand in orienteering, was quick to agree saying the fact her dad did the first Coast to Coast meant it’s always been an event she’s wanted to do. Selena Metherell is the women’s individual two day Kathmandu Coast to Coast leader after the first day. There were some family nerves about how tomorrows kayak might go after today’s mountain run played to her running strength and Metherell hopes a knee she hurt today won’t affect her defence of a 12 minute lead over Hannah Lund when racing gets underway at 7am from Klondyke corner. A group of 20 cyclists in the individual event got away off the front of the race, after the short run off Serpentine Beach near Kumara on the South Island’s West Coast early this morning. The group dropped five riders by the time it reached the start of the mountain run at Aickens with Sam Bell and Lachie Brownlie first off the bikes. The pair were together until Brownlie took a more direct route heading up the Deception Valley to establish a small lead as both athletes struggled with cramp in the hot conditions. Competing in his first Coast to Coast former age group national duathlon representative Bell picked up the pace over Goat Pass to catch Brownlie and once on the flat put the hammer down to take the lead in the two day men’s individual event finishing the first day in five hours and twenty six minutes, seven minutes ahead of Brownlie. In a repeat of last year’s effort Daniel Jones was first to cross the line in Klondyke to give their three person mixed team Top Sport an impressive lead of more than an hour over Here for the Beers James Nissen, Shannon Edgar and Reon Park who lie second in the mixed three person teams and an 11 minute lead over the leading three person men’s team Encrampment’s Ben Williams, Max Rubbo and Martin McDonald. Jones, who was ninth in 2017’s World Championship Longest Day and completed five years in the United States on an athletics scholarship, ran the 30.5 kilometre Mingha Deception route in a time of two hours and 49 minutes reeling in and passing two day individual leaders Bell and Brownie who had started the day 15 minutes before Jones. Robert Loveridge and Tony McGuire lead the two person men’s teams while Bender Bro’s Cory Sutherland and Calum Sutherland are the team to beat in the tandem team’s event that includes former All Black Captain Richie McCaw and New Zealand Rugby Players Association boss Rob Nichol who are one hour and 21 minutes behind the leaders time of six hours and 48 minutes. 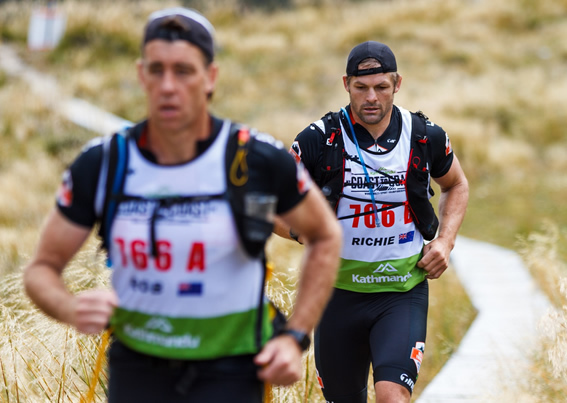 All Black Captain Richie McCaw and New Zealand Rugby Players Association boss Rob Nichol on the mountain run on the first day of the Kathmandu Coast to Coast. "It wasn't as quick as we perhaps had in mind,” McCaw said. “Some days are like that so it’s just good we made it. I thought we might have been a little quicker if we'd been feeling a bit better, but it was what it was. Couldn't have gone any quicker I tell you," McCaw said. Chris Harte from Christchurch won the men’s mountain run event in a time of three hours and 34 minutes beating Ben Jozefiak by 22 minutes while Julia Chamberlain from Darfield was first home in the women’s event in a time of four hours and 44 minutes with Stephanie Blake coming second four minutes behind. Australian inspirational burns survivor and ultramarathon competitor Turia Pitt completed the Mountain Run in less than six hours, her first foray back in to the world of competitive events, just over a year after the birth of her son, Hakavai. The World Championship Longest Day event gets under way at 6am tomorrow featuring four time winner Elina Ussher who is competing in her fourteenth straight Coast to Coast and a very open men’s field that does not have a previous winner on the start line. 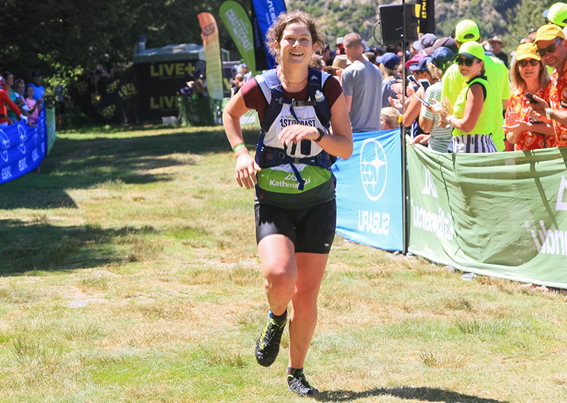 Ussher will face a number of strong women including Christchurch based German Simone Maier, Swedish adventure racing champion Marika Wagner and Whakatane’s Corrinne O’Donnell. The women’s race has a deep field with Australians Bern Dornom and Leela Hancox and Kiwis Claire Bell, Isla Smith, Fiona Dowling and Georgia Whitla all potentially podium contenders. The men’s race is shaping up as arguably one of the most exciting in years with Alex Hunt from Australia aiming to be first foreigner to win the one day men’s race since World Marathon Kayak Champion Australian John Jacoby won in 1993. Christchurch based Sam Manson and Wanaka endurance athlete Dougal Allan loom as the two Kiwi favourites to take the one day win with Australian Tim Boote and Kiwis Andrew Sclater, Bobby Dean, Ryan Kiesanowski, Sam Goodall and veterans Nathan Peterson and Brent Edwards all athletes expected to make their presence felt.